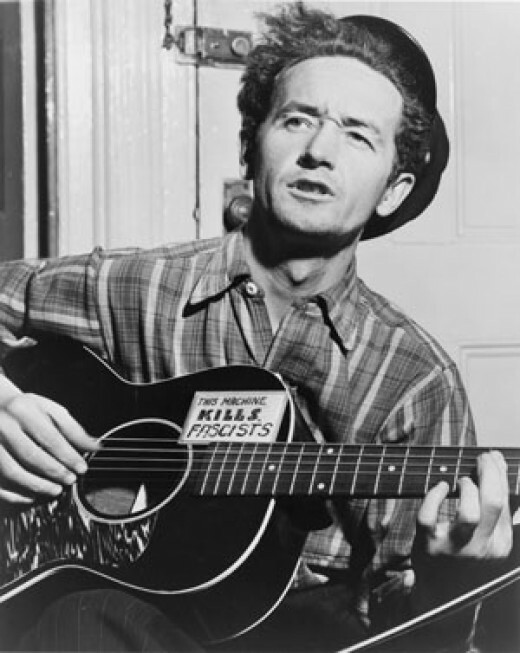 Woody Guthrie, the Dust Bowl Troubadour's Songs of Patriotism, and Despair. American Patriot, Poet, and His Relevance To Today. Woody Guthrie is an American musical legend. I clearly remember my youth in rural Texas, and going to school and singing This Land Is Your Land ; and I only wish that youths today could get to share that experience. Here's the facts for you, today's America doesn't appreciate the patriotism of the Dust Bowl Troubadour . Patriotism, you see, isn't what it used to be. Today in American, when someone thinks of patriotism, they most likely think that a "patriot" embraces the ideals of corporate fascism, and the lies of a media that is owned by the friends of bankers, or even by the bankers, internationalist, globalists, one and all. But not Woody Guthrie, the songs of Woody Guthrie are all from a man who lived through America's Great Depression , a direct result of international banking manipulations. But the Dust Bowl can't be blamed on Rothschild banking crime syndicates, no, Rothschild can't control the wind. Of course the Dust Bowl brought America the Joad Family , and those Grapes of Wrath ; I doubt that those things are taught any more in what passes for education in America either. Official Woody Guthrie web site with biography, lyrics, artwork, the Woody Guthrie Foundation, the Woody Guthrie Archives, news and events, and educational programs. As George Carlin so famously said, and I paraphrase, "they call it the American Dream, because you'd have to be asleep to believe it." There is a ton of truth inside that, but there is also truth in America being called "The Land of Opportunity," and we still have a whole lot of opportunity here, and while I love George Carlin, and the video that I've provided here, I'd like to also state that things aren't as negative as Mr.Carlin would have had you believe. We the people can always overtake the wealthy elites of this world and their sick agenda to become "godlike," any time that we get ready. It's not going to happen though, as I am a believer in all things Bible prophecy. I merely state what I see, and see Bible Prophecy unfold all around me at all times. The Owners Of This Country. I look around me, and I see nothing but class struggle; does that make me a communist? 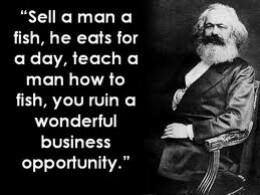 America, following the Hegelian Dialectical Model, is now a country that mixes both communism and capitalism, as it must, as the masons and architects of this world have created this synthesis from the thesis and anti thesis of communism vs capitalism. Do I then, believe in humans with superpowers and such skill that they can orchestrate History and reality itself? Absolutely not, humankind's powers to orchestrate and control are an absolute joke. Talk to your spirit guide about that, and ask him or her what they think, legion, for you are many too. But Karl Marx, purported Satanist, was entirely correct when he'd said that History is all class struggle, he'd only neglected to tell you the rest of it, and about his "ascended masters," and "spirit guides," you see, that wasn't to his liking, for you to know about such things, the spiritual. Call me a communist if you feel comfortable with that, I believe I just told you all I know and believe about communism. Concerning Woody Guthrie, I've no idea if he was a communist or not, and I couldn't care less; what I do know, is that greed keeps the wealthy with their wealth, and greed is the symptom of their inhumanity towards man. It's also the damnation of the "elites," and no, ye shall NOT be as Gods, Eve figured that one out when she died, or maybe, when the allegorical garden was sealed off, with an angel at it's gates. Pretty Boy Floyd, a Woody Guthrie Tune, by Roger McGuinn. Buy Patriotic Woody Guthrie Music On Amazon.com!! Basically, it matters not at all to me what your theory of economics is, except that, should your theory of economics prevent you from recognizing that you are, in fact, your brother's keeper, and that every man and woman in this world is, in fact, your brother and sister, your mother and father, then you are quite simply, living wrong. You see, YOU are your brother's keeper, and the entire world is your brother. The top one percent of this world owns it all, and leaves the bottom 99%, it's very own brothers and sisters, mothers and fathers; to starve, or die; they do not care. This land, this Earth, however, was made for YOU and for ME. It's time we take it back from David Rockefeller, and Evelyne Rothschild; and share it amongst ourselves, and if possible, maintain that system. It won't happen, but I can dream. Leo Kottke, Folk Music, and Acoustic Guitars. Though Six and Twelve String Guitarwas not the first recorded album by Leo Kottke, it was certainly my introduction to him, and the album that put him on the forefront of everyone's mind who played guitar or was interested in that kind of music. Some folks call it folk music, and folk music it is, but the music of Leo Kottke is more like folk music on amphetamines or psychedelics. I've read it described asTurbo Folk, and that description works very well for it too. Six and Twelve String Guitar, also widely known as "the armadillo album" combined elements of the strange and the absolutely beautiful. The very names of the songs on the album let you know what the song will be like. Musical giants like J.S. Bach are covered with Jesu, Joy Of Man's Desiring, beautiful "Travis style" picking tunes are evident, and are very traditional in their sound, like The Fisherman - and then there's Vaseline Machine Gun. Maybe "folk music on steroids" is an apt enough descriptor too. "sounds like geese farts on a muggy day." Fingerpicking on Steel String Guitars. Now playing folk tunes, classical tunes, and extremely creative tunes fingerstyle on an acoustic steel string guitar wasn't really anything new, people like Doc and Merle Watson, Merle Travis, and virtually every Piedmont Bluesman had been doing these things. Using a slide was also something that wasn't unique, what was unique was the sheer energy that Leo Kottke brought to his music. Despite all of the guitar virtuosity that Leo Kottke routinely displays, his showmanship is what I find the most appealing about him as a person. The man is hilarious, and had he not become on of the world's finest folk musicians and guitarist - he'd of made a great comedian. I've had the pleasure of seeing Leo Kottke perform live, and I tell you the truth - the man breaks up his shows with stories about things that can leave an audience in tears from the laughter of it all - then he'll play something so beautiful as to be breath taking. Leo Kottke - Persevering Through Hearing and Health Issues. It's perhaps unlikely that Leo Kottke ever became a musician at all. A childhood injury involving a firecracker had permanently damaged one of his ears, and his hearing problems increased further after a stint in the United States Navy - think big guns, and firing practice. 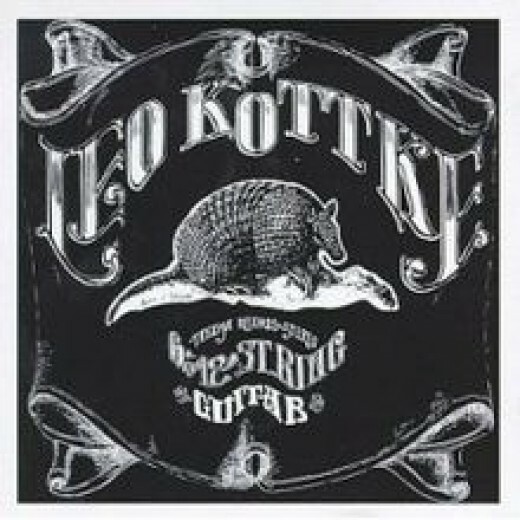 The energy of Kottke's fingerstyle guitar playing is evident, and by 1980 he'd developed tendinitis in his right hand; and this forced him to adopt and adapt to an entirely new technique for picking. 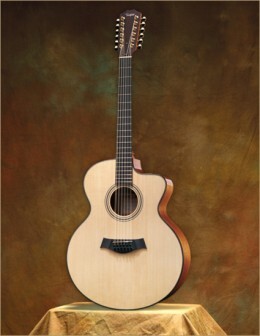 The Leo Kottke Signature Guitars By Taylor Guitars. Leo Kottke and Taylor Guitars. Leo Kottke, despite his health problems related to tendinitis in his hands, never stopped playing, but he had stopped playing twelve string guitars because with six additional strings - a twelve stringed instrument is just that much harder to play, and more aggravating to tendinitis. But Leo had found a Taylor instrument that he could play in a twelve string model - because of the ease with which that guitar could be played in his style. Soon, Bob Taylor and Leo Kottle formed a working relationship, and Kottke had remarked that Bob was one of the few people that he'd ever met who could and would talk about guitars as much as he would. Kottke's style is different than most others, and so his guitars, and guitars built to his liking must also be different. Soon, there was a Leo Kottke Signature Model twelve string guitar by the Taylor Guitar Company - a guitar built to Leo Kottke's personal specifications. This is a mahogany body instrument with a spruce top and rosewood binding - the guitar is all solid wood construction, but is braced very lightly, which makes this guitar a more fragile instrument than most twelve string guitars. 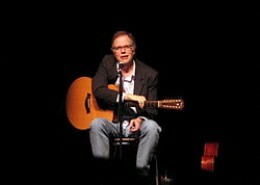 The guitar is lightly braced because Leo Kottke most often plays his guitars de tuned - meaning that he tunes his instruments flat, with lesser tension on the strings than standard pitch tuning. There is also a Taylor Leo Kottke Signature six string guitar - which is the same instrument but the six string is NOT as lightly braced, and is built to be tuned to standard 440 pitch in standard tuning. I'm pricing these outstanding guitars at between $2,300.00 to $3,300.00. I'd say that you've no room or chance at haggling the price at twenty three hundred bucks, but should you find one priced over three grand - then there's a great chance that the seller will come off of the price a bit. I hope everyone has either been introduced to the outstanding music of Leo Kottke, or has some favorite songs and vid links to share with me in the comments - there's so much music out there, and so little time! Little Martha - Leo Kottke's Interpretation.